Horticulture is an industry that will always be with us; human life cannot exist and thrive without plants - they are integral to human survival. That fact alone makes horticulture not only important, but perhaps the only career that mankind is unlikely to ever see disappear. 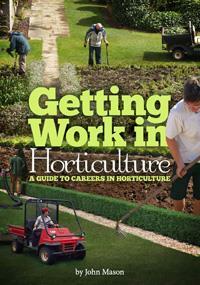 The Getting Work in Horticulture Ebook goes through the careers in the horticultural industry that will have great potential in the future. With 72 pages of helpful and insightful industry information, this ebook is a must have for anybody who is in the industry or interested in working in the industry. This ebook has been written by John Mason, who has been in the horticulture industry in many various roles since 1979 and staff of ACS Distance Education.